Essay on How to Understand Contemporary Plastic Art. Ain Sakhri Lovers (c.9000 BCE).  Art Evaluation: How to Appreciate Art.  See also:Venus de Milo (c.100 BCE); Laocoon and His Sons (c.42-20 BCE). In very simple terms, the expression "modern 3-D art" refers to sculpture of the modern era, which began about 1850. It was the time when traditional principles of art were coming under serious pressure from modernists, who were beginning to question some of the pedantic conventions of academic art, as taught in the grand European academies of fine arts. At the same time, movements like Impressionism, Expressionism, Cubism and Futurism, introduced twentieth century sculptors to a variety of revolutionary ideas. The aesthetics of modern sculpture were characterized, above all, by a move away from simply copying nature (eg. in traditional-style portraits, group scenes), towards works with more of a message - more of an attitude! Conventional rules of composition, perspective, and presentation were discarded, while the type of materials used, widened dramatically. In order to appreciate the huge changes introduced by modern plastic art, remember, most sculpture schools taught only drawing from life, and stone carving, with perhaps some bronze casting and wood-carving on the side. They were totally ill-equipped to respond to the clamour for new ideas, new methods and new materials. To help you learn (or teach students) how to evaluate works of modern sculpture, this webpage contains explanations from most of the major schools, from the mid-19th century to the present day. It features references to important modern artists along with their artworks, with individual explanations where relevant. That said, no written article about 3-D art appreciation is as instructive as a visit to a sculpture gallery, garden or museum, where you can walk around or even 'into' the exhibits and study them closely from different angles. So please visit our guide to the best art museums. Remember, sculpture is a three-dimensional art, and can only be fully appreciated in the flesh. Dog (1994) by Jeff Koons. Nineteenth century sculptors had a hard time. Religious patronage had collapsed, while state patronage was uncertain, and limited largely to commemorative statues of monarchs, patriotic statesmen and clerics. It wasn't until the turn of the century that sculptors were able to reflect the new trends of modern art. One exception to this was the great French sculptor Auguste Rodin (1840-1917). Rodin considered himself to be the natural successor to his hero Michelangelo - even though the Florentine was a carver in stone while Rodin was primarily a modeller in bronze. The individual styles of the two men were also poles apart. Michelangelo epitomizes the timeless nobility of Classical Antiquity, whereas Rodin's works are unmistakably modern, with a dramatic, expressive naturalism. Rodin's true predecessors are surely the Gothic sculptors, of whom he was a passionate admirer. See in particular his masterpieces such as: The Age of Bronze (1876, Musee d'Orsay, Paris), The Thinker (1881, Musee Rodin, Paris), The Kiss (1888-9, Musee Rodin, Paris) and The Burghers of Calais (1889, Musee Rodin, Paris). Other sculptors of the period worth studying, include: the romantics Francois Rude (1784-1855) and Auguste Preault (1809-79); the highly talented, light-hearted Jean-Baptiste Carpeaux (1827-75), and his follower Jules Dalou (1838-1902); as well as the classicist Alfred Stevens (1817-75), and the versatile George Frederick Watts (1817-1904). In addition, the 19th century produced several masterpieces of architectural sculpture. These include: Nelson's Column (1840-3), the 185-feet monument to Lord Nelson (topped by a 17-feet high statue of Nelson himself) designed by E.H.Baily and located in Trafalgar Square; the Statue of Liberty (1886, Liberty Island, New York Harbour), the iconic 302-feet high statue designed by the French sculptor Bartholdi (1834-1904); and the Parisian landmark, the 1,000-feet high wrought-iron Eiffel Tower (1885-9), designed by the engineer Gustav Eiffel and architect Stephen Sauvestre. In 1922, the American sculptor Daniel Chester French (1850-1931) achieved immortality with another monumental public sculpture - the seated figure of Lincoln at the Lincoln Memorial in Washington DC. For biographies of critics and commentators, like John Ruskin and others, see: Art Critics: Criticism of Visual Arts (1750-present).  Orestes Sheltered in the Pallas Altar (1840) Rouen. Pierre-Charles Simart.  Napoleon Rising to Immortality (1847) Fixin les-Dijon. Francois Rude.  Tarcisius, Christian Martyr (1868) Musee d'Orsay. Joseph Falguiere.  The Dance (1869) Musee d'Orsay. ean-Baptiste Carpeaux.  Despair (1869) Musee d'Orsay. Jean-Joseph Perraud.  The Wellington Memorial (1858-75) St Pauls Cathedral. Alfred Stevens.  Horse with a Harrow (1878) Musee d'Orsay. Pierre Louis Rouillard.  Ophelia (1876) Musee d'Orsay. Auguste Preault.  The Sluggard (1885) Royal Academy of Arts. Lord Frederic Leighton.  Physical Energy (1904) Kensington Gardens, London. G.F.Watts.  Kneeling Youth at the Fountain (1898) Musee d'Orsay. By George Minne.  Standing Bather (1899) Musee d'Orsay. Aristide Maillol.  The Gates of Hell (1880-1917) Musee Rodin. Auguste Rodin. The new century witnessed the emergence of the first of the great modern sculptors Constantin Brancusi (1876-1957) and Umberto Boccioni (1882-1916). In The Kiss (1907, Hamburgerkunsthalle, Hamburg) and Sleeping Muse (1910, Metropolitan Museum of Art, New York), Brancusi reduces natural forms to their ultimate basics, without losing their essential humanity. 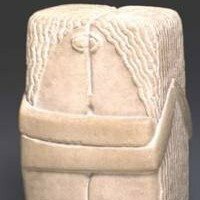 The Kiss, in particular, conveys a profound primitivism, but one that illustrates Brancusi's faith in the power of human emotion. Looking at the world with a more politico-historical focus, Boccioni's Futurist-style Unique Forms of Continuity in Space (1913, Museum of Modern Art, New York) epitomizes the movement and dynamism of the machine age. It personnifies the new technological man, powerfully striding through space, and symbolizes his triumph over nature. Both sculptors exemplify the trend away from representationalism, towards a more challenging idiom in which conceptualism and formalism merge. Cubism, the revolutionary style of modern art pioneered by Pablo Picasso (1881-1973) and Georges Braque (1882-1963), triggered a wave of experimentation in abstract sculpture. Examples of Cubist 3-D art include: Woman Walking (1912, Denver Museum of Art) by Alexander Archipenko (1887-1964); Large Horse (1914, Musee National d'Art Moderne, Centre Georges Pompidou, Paris) by Raymond Duchamp-Villon (1876-1918); Man With Guitar (1915, MoMA, New York) by Jacques Lipchitz (1891-1973); Head of a Woman (1917, MoMA, New York) by Naum Gabo (1890-1977); Fruit Dish with Grapes (1918) by Henri Laurens (1885-1954); and Torso (1924-6, MoMA, NY) by Antoine Pevsner (1886-1962). The carnage of World War I led to harrowing sculptures like Fallen Man (1916, New National Gallery, Berlin) and Seated Youth (1918, Stadel Art Institute) both by Wilhelm Lehmbruck (1881-1919), the expressionist artist who committed suicide after his experiences in a World War I hospital. It also led directly to Dada, whose concept of junk art was aptly illustrated by Fountain (1917, replicas in several museums) by Marcel Duchamp (1887-1968), and the unique Merzbau of Kurt Schwitters (1887-1948). This was driven by the concept of technological progress: see 3-D art movements such as Futurism and Constructivism. The ultra-pure idiom of abstract sculpture, from which all true-life distractions have been purged: see, for instance, De Stijl and Abstraction-Creation. Early ideas of kinetic art, epitomized by Bird in Space (1925-31, Kunsthaus, Zurich) by Constantin Brancusi (1876-1957); Rotative Plaques (1920, Yale University Art Gallery) by Marcel Duchamp (1887-1968); Kinetic Construction (1919-20, Tate London) by Naum Gabo (1890-1977); numerous 'mobiles' by Alexander Calder and works like Light-Space-Modulator (1930, Busch-Reisinger Museum) by Laszlo Moholy-Nagy (1895-1946). A lingering Dadaism or anti-establishment feeling: during the 1920s, this found its feet as Surrealism, a hugely influential movement which sought a new "super-realism" in a medium which incorporated representational, abstract and semi-abstract art. Important surrealist sculptors include: Salvador Dali (1904-89) who produced his marvellous Mae West Lips Sofa and Lobster Telephone (1936, Tate Collection); Meret Oppenheim (1913-85) who created the whimsical Furry Breakfast (1936, MoMA, New York), and Alberto Giacometti who produced the stunning Woman with her Throat Cut (La Femme Egorgee) (1932, Private Collection). A growing style of biomorphic abstraction, exemplified by Jean Arp (1886-1966) see his Torso (1932, Georges Pompidou Centre); Henry Moore (1898-1986); and Barbara Hepworth (1903-75), see her seminal Pierced Form (1931). Usually abstract sculpture made out of metal: exponents included David Smith (1906-65), and Anthony Caro (1924-2013). This period witnessed the continued evolution of the six styles of sculpture listed above, as well as an amount of genuine innovation. This style is the only one whose advancement seems definitely to have narrowed. At present it survives only in architectural sculpture: a 21st century example being The Spire of Dublin, known as 'the spike', designed by Ian Ritchie RA. However, this type of sculpture will rise again, no doubt in new surroundings (eg. in space, or on water). This style was taken to new heights by the Minimalism school during the 1960s. American sculptors - such as Sol LeWitt (b.1928), Donald Judd (1928-94), Walter de Maria (b.1935), and Carl Andre (b.1935) - focused on creating an intellectual type of art pared down to its fundamentals. Difficult to understand or discuss, unless one has a PhD in aesthetics. We should note in passing, however, that the contemporary art expert and collector Charles Saatchi attaches profound significance to the work of Donald Judd. Famous minimalist sculptures include: Cage II (1965, MoMA, New York) by Walter de Maria; Equivalent 1 (1969, Kunstmuseum, Basel) by Carl Andre; and Stack (1967, MoMA, New York) by Donald Judd. Post-war kinetic sculpture was exemplified by Relief Mobile 5 (1954, Musee d'Art Moderne, Saint-Etienne) by Pol Bury (1922-2005); Signal: Insect Animal of Space (1956, Tate London) by Takis (b.1925); and the extraordinary self-destructing contraptions assembled by the Swiss avant-garde artist Jean Tinguely (1925-1991), such as Homage to New York (1960, Museum of Modern Art, New York). Tinguely's works combined sculpture, process and performance art in a unique visual feast. One might also argue that the temporary environmental sculptures (eg. made of snow) by Andy Goldsworthy (b.1956), also belong in this category. This tradition was renewed by members of the Pop Art movement. Examples include the giganticism of Claes Oldenburg (b.1929), see for instance his Giant Fag-Ends (1967) and Apple Core (1992); as well as the humorous Joe Sofa (1968) by the Italians Jonathan De Pas (1932-91), Donato D'Urbino (b.1935) and Paolo Lomazzi (b.1936). In addition, the works of Cesar (1921-98), (squashed cars); and the junk sculpture of Arman (b.1928) (heaps of broken telephones) clearly qualify as belonging to the absurd, as do the Maman spider sculptures of Louise Bourgeois (1911-2010); and the unique stick-like figures of Alberto Giacometti, such as Tall Woman II (1960, Museum of Modern Art, New York). In Feb 2010, Giacometti's life-size bronze Walking Man I (1961), sold at Sotheby's in London for £65 million ($104 million) - the highest-ever auction price for a sculpture. This genre was actively continued by both Henry Moore and Barbara Hepworth, before (arguably) reappearing in the monumental abstract works of Richard Serra (b.1939). Studying Serra's Snake (1994-97) at the Guggenheim Museum, Bilbao, one can't help thinking of it as a living entity. Another outstanding work in this category is Divided Head (1963, Fiorini, London) by Cesar Baldaccini. and Mark Di Suvero (b.1933), see his Storm Angel (1974, Chalon-sur-Saone). NOTE: In a category of its own are the emotive memorial sculptures commemorating the Shoah (1933-45). This form of Holocaust art is exemplified by the Treblinka and Dachau memorials. Pioneered by Jean Dubuffet (1901-85), assemblage art comprises works made from fragments of natural or man-made objects, such as household or domestic debris. Examples include the "sculptured walls" of Louise Nevelson (1899-1988), typically made out of wooden crates, sprayed with black or gold paint and arranged in box-like shelves. See also works by the German avant-garde sculptor Joseph Beuys (19211986). Assemblage was given a huge promotional boost by an important show entitled "The Art of Assemblage" - held in 1961 at the Museum of Modern Art, in New York. Emerging out of Pop Art and Photorealism, this is an American-based figurative genre in which certain stereotypical individuals are re-created down to the last true-to-life detail, using polyester/fibreglass and other materials including human hair. The style is exemplified by works like Young Shopper (1973, private collection) by Duane Hanson (1925-96); and Couple (1971, Georges Pompidou Center, Paris) by John De Andrea (b.1941). See also the hyperrealist swimmers of Carole Feuerman (b.1945). The monumental design traditions of Joseph Stalin and Albert Speer were kept alive by the colossal works of Turner Prize Winner Antony Gormley (b.1950) - see his Angel of the North (1997-8, Gateshead, UK); and Turner Prize Winner Anish Kapoor (b.1954) - see his Marsyas (2002, Tate Modern Exhibition). Certain types of earth sculpture or Land Art, also fall into this category. Some works by the English school of postmodernist art, led by Damien Hirst (b.1965), Rachel Whiteread (1963) and Tracey Emin (b.1963), could easily be categorized under The Absurd, but in fairness they deserve a special category all of their own - one might call it the 'Completely and Utterly Absurd'. This type of contemporary art is characterized by Hirst's The Physical Impossibility of Death in the Mind of Someone Living (dead shark, 1991) and Flock (dead lamb, 1994); and by Whiteread's Untitled (House) (1993). For 3-D art in Ireland, see: Irish Sculpture: History, Sculptors.  Crouching Figure (1907) Museum of Modern Art, Vienna. By Andre Derain.  End of the Trail (1915) Brookgreen Gardens, USA. By James Earle Fraser.  Fighting Stallions (1950), HH Sculpture Garden. By Anna Hyatt Huntingdon.  Adam (1938) Harewood House, UK. By Sir Jacob Epstein.  Man in the Open Air (c.1915) MoMA, New York. By Elie Nadelman.  Abstraction (1946) Georgia O'Keeffe Museum, Santa Fe. By Georgia O'Keeffe.  The Destroyed City (1953) Schiedamse Dijk, Rotterdam. By Ossip Zadkine.  Linear Construction in Space, 4 (1962) Whitney Museum. By Naum Gabo.  Mother and Child (1930) Honolulu Academy of Arts. By Jacques Lipchitz.  Arc of Petals (1941) Guggenheim Museum, NY. By Alexander Calder.  Moon Head (1964) Henry Moore Foundation, Leeds. By Henry Moore.  Sky Cathedral (1958) Museum of Modern Art, New York. By Louise Nevelson.  Open Geometric Structure IV (1990) Private Collection. By Sol LeWitt.  Floor Burger (1962) Gallery of Ontario. By Claes Oldenburg.  Ale Cans (1964) Offentliche Kunstsammlung, Basel. By Jasper Johns.  Cloud Gate (2004) Millennium Park, Chicago. By Anish Kapoor.  Michael Jackson & Bubbles (1988) Astrup Fearnley Museum. By Jeff Koons.  Puppy (1992) Bilbao Guggenheim. By Jeff Koons.  For more about sculpture appreciation, see: Homepage.